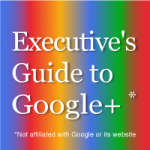 The Executive’s Guide to Google+ educates executives about the emerging strategic value of Google’s social push as a means to drive intimacy and engagement among their stakeholders—and a potential disruptor and game-changer among well established social networks. Unlike “pureplay” social networks Facebook and LinkedIn, Google has a multidimensional ecosystem of Web services to which its social push will add value, so I am watching it very closely and will share my thoughts here. The EGSN’s point of distinction is a unwavering focus on applying Google+ to business processes. CSRA launched the Executive’s Guide to Google+ in Q4 2011 to apply the methodology of the Executive’s Guide to LinkedIn to Google+, so it brings rigor to the practical aspects of applying (relatively) immature technology and behavior to high-value business processes. Access the Guide to Google+ sections under the Google+ menu in the horizontal navigation bar, or directly from this page. Return here from any section of the Guide to Google+ by clicking its logo. EGSN Posts are my thought leadership. Best of the Web are hand-picked by me; Case Studies are the best examples I can find. Ask the Guide lets you can ask us your Google+ questions.